DVD duplicator and CD copier is developed by Copy stars for professionals and home users. 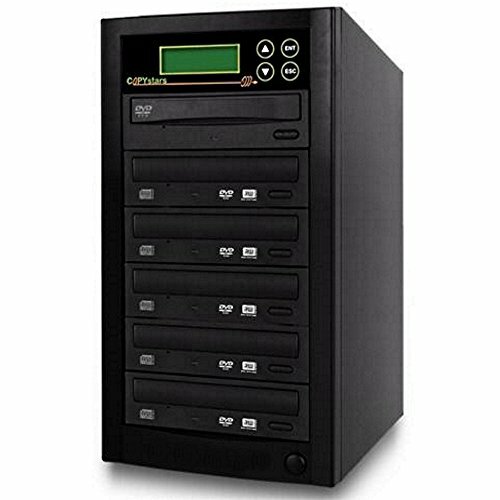 Power supply is UL, FCC and TUV certified duplicator power supply which ensure high standard of safety and reliability this CD DVD duplicator burner can compile multiple tracks of audio onto a single disc from multiple sources. Support DVD-R, DVD-RW, DVD+R, DVD+RW, DVD+R double layer, DVD-R dual layer, mini DVD-R, CD-DA, video CD, photo CD (single and multi-session), CD-text, DC-extra, CD-R, CD-RW, business card CD-R, 3" mini CD-R. The CD DVD duplicator burning speed for full 700MB CD is less than 3 minutes and it takes about 6 minutes to copy full 4.7GB DVD disc. This duplicator is also capable of duplicating dual layer (DL) DVD media discs. Fast DDR2 buffer memory-memory speed 4x faster than competing models using scram. Other features such as: Multi-language support-language is displayed in, English, Spanish, Portuguese or Japanese ,dual-level security-separate startup and setup passwords to prevent unauthorized usage. Advance function included : Priscian, compare, test(simulation of copy),track edit, CD over burn ,firmware update and many more. Maximum DVD burner writing speed: DVD+/-R: 24X, DVD+/-RW: 8X, DVD+/-DL: 8X, CD-R: 52X, CD-RW: 32X. Supported disc formats : DVD-ROM, DVD-R, DVD-Video, DVD-RW, DVD+R, DVD+RW, DVD+R9, CD-DA, CD-ROM Mode 1, CD-ROM XA Mode 2, Multi-session Photo CD , CD-I, Video CD, CD Extra (CD Plus). Supported recording discs : 12cm 4.7GB DVD-R/RW, 12cm 4.7GB DVD+R/RW, 12cm 8.5GB DL DVD, 12cm 80min/700MB CD-R, 12cm 74min/650MB CD-RW, 8cm 1.47GB mini DVD-R, 8cm 24min/210MB mini CD-R, 8cm 50MB Business CD-R. All Copy stars CD DVD duplicator carry 3 years labor and 1 year parts warranty, Unlimited 1800 toll free support.